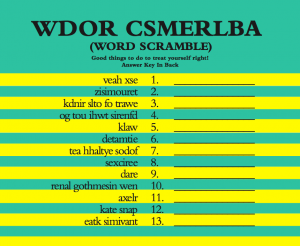 We love word scrambles because they allow us to say things right off the bat that at first don’t make any sense, and sound really funny (it seems we are doing this more and more these days and not necessarily on purpose). In this fun format, we can say anything we want without people knowing what we mean at first. At a stage of life when words, thoughts, and deeds can sometimes get scrambled, we wanted to embrace this activity and just enjoy it.